The grapple bars delivered to the Space Station by SpaceX's Dragon capsule were unloaded today (March 6). A private cargo capsule is returning to Earth from the International Space Station Tuesday (March 26), and you can watch its orbital departure live online. SpaceX's unmanned Dragon spacecraft is slated to depart the orbiting lab at 6:56 a.m. EDT (1056 GMT) Tuesday (March 26), perform a series of burns and then splash down at 12:34 p.m. EDT (1634 GMT) in the Pacific Ocean, 246 miles (396 kilometers) off the coast of Baja California. You can watch Dragon depart the space station live on SPACE.com beginning at 4 a.m. EDT (0800 GMT) when undocking activities begin, thanks to a live feed provided by NASA TV. 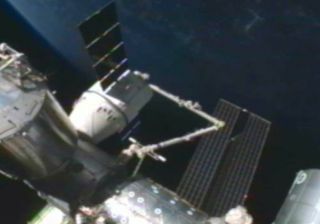 Dragon is wrapping up its second contracted cargo run to the space station for NASA. The capsule launched on March 1 and arrived at the orbiting lab two days later after overcoming an unexpected thruster malfunction. The Dragon capsule delivered about 1,200 pounds (1,210 kilograms) of supplies to the space station and will return about 2,670 pounds (1,210 kg) of equipment, hardware and scientific experiments when it returns Tuesday. Packed among that returning cargo is a batch of LEGO toys that have been on the space station for the last two years. NASA has also signed a $1.9 billion deal with Virginia-based Orbital Sciences Corp. to make eight unmanned cargo flights with its Antares rocket and Cygnus capsule. Antares is scheduled to make its first test flight in mid-April, and the rocket should blast Cygnus toward the station on a demonstration mission later this year if all goes well, Orbital officials have said.